Sachiko Murakami has an extensive, well-organized website on cooking with a microwave oven—and not just nuking a burrito, either. Her site has recipes for full-fledged dishes, such as "spicy tofu" (see below). Shoji Tabuchi came to America from Japan 30 years ago with not much more than his fiddle and a love for country music. Now he has his own theater in Branson, Missouri, and of course a website. When your energy level is low, here is a list of ways to give yourself a boost naturally. The clearly clued-in people who put together this list include green tea, which can give your system a healthy but mellow boost. Add this to the list of uses being found for green tea polyphenols: as an additive to naturally prevent browning in dairy products. The newest extreme sport in Japan: extreme ironing. He must be using a veeeery long extension cord. NAGOYA -- A dog that strayed into a subway tunnel here Tuesday morning forced one train to stop and others to travel at reduced speeds, the operator of the line said. "Hakone Kowakien Yunessun" may be a mouthful, but it's a fairly impressive-looking spa resort. One of the dozen or so spas there is a green tea spa, pictured below. Today, be sure to have an extra helping of cranberries—they're good for you! Speaking of Thanksgiving, you know what's really nice after a big, heavy meal? A nice, warm cup of green tea. Whoops. A submarine of Japan's Maritime Self-Defense Force struck a cargo ship off the coast of Miyazaki. Just in time for Thanksgiving: a piece on how green tea can help you lose weight. In Japan, throngs of men once married to their jobs are retiring to stay home all day and drive their wives crazy. 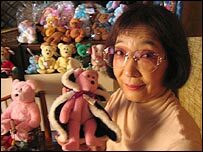 Mrs. Terakawa deals with Retired Husband Syndrome (RHS) by collecting teddy bears (which is probably better than throttling Mr. Terakawa). By way of Digg.com: some stunning photos of Tokyo's underground storm drain system. The photo below shows what's termed a "storm surge chamber." On the photo page, click on the left and right arrows in the bottom corners to view other pics. "What? A storm drain, you say? I thought this was modern art." A Theracane is a great way to give yourself a massage. Even a good, old-fashioned walking cane will do if you have one. One caveat: I've never bought from any of these Froogle.com merchants, but I can vouch for the Theracane itself—it's great. Before Mira Bergen starts her hectic day of meetings, phone calls and site visits, the commercial real estate broker enjoys quiet before the storm. I could not live without meditating," said Bergen, who began in 1981 and says the 20 minutes each morning helps keep her focused. "If I miss it, it's like not brushing my teeth." A photo of an outdoor tea ceremony at Yushima Tenjin Shrine in Tokyo. It's a universal guy thing—the desire to strap something to your back and take to the skies. Japan is at another crossroads: The economy is finally picking up, but the population as a whole is getting older, and China is taking Japan's title as manufacturer for the world. The number-one topic among the country's pundits is what the new national identity can or should be. Will Japan's new prime minister—the first born after World War II—help the country "find itself"? "I have a question. Shouldn't the dark fabric be used for the underarm area?" The Japanese are trying to come up with a robot that can tell good wines from bad and even recommend a cheese to go with your wine selection. But here's the funny part: At the unveiling, a wise-alleck reporter stuck his hand into the robot, which identified the human flesh as ... bacon. Green tea is being used in more and more skin-care products. But there's an easier, less expensive way to give your skin the benefits of green tea: Take some cooled-down green tea and splash it on your face, then pat-dry the excess. After you face dries, it will feel clean, soft, and smooth. Tsunami alerts issued after an 8.1-magnitude earthquake struck near Japan's northern coast have been lifted, according to the Pacific Tsunami Warning Center. These folks weren't taking any chances—they got to high ground. "Presenteeism," a play on the word "absenteeism," refers to productivity lost on the job due to stress and other health reasons. Two British consultants have made a career of helping a company's employees figure out how to reduce stress in their lives. This shows what a huge industry the whole "stress reduction" business has become. A much less expensive alternative is drinking Mellow Monk green tea. 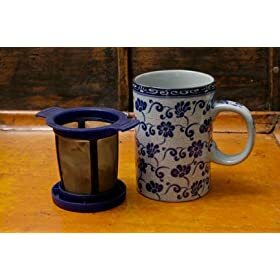 Amazon.com has a good selection of permanent tea filters/infusers. Click here to check out the one shown below. Permanent infusers are about the easiest way there is to brew loose-leaf tea. (You provide the cup or mug, and no teapot is required.) You place the infuser (sometimes called a filter) into your favorite cup or mug, drop a three-fingered pinch of Mellow Monk tea inside, pour in hot (but not just-boiled) water, wait three minutes and—voila—tea time! It's a good idea to have a saucer ready so that you can place the infuser/filter on it when you're done brewing (otherwise, it will drip on your desk or counter or wherever you are brewing tea). The Angel Doggie website has been redesigned. The artist who runs the site, Galen Hazelhofer, specializes in animal portraits, including "angelized" paintings of pets who have gone on, but she paints other subjects, too. Daisuke Matsuzaka is one of Japan's hottest baseball pitchers. He throws a pitch known as the gyroball, also known as the "ghost pitch," which is said to be the first new pitch in baseball since the split-fingered fastball. Tonight or tomorrow, he'll announce which U.S. team he'll be playing for. The winning bid is reportedly in the $30 million range. Ivabelle Bernabe, 47, took up painting as a stress-relieving activity and found she had a real gift for it. My own father, who had always been a "shower singer," discovered amateur theater after retiring. Today, he sings in a local musical revue that raises money for charity. He loves it. Who knows what secret skill might be lying dormant inside you? Cat Fancy magazine ran an article on the origins of Japan's maneki neko, the ubiquitous beckoning-cat statue. According to legend, the tradition dates back to a real-life cat who beckoned a famous general away from a spot where lightning struck the ground only seconds later. I, however, had always imagined a different origin for the tradition. Anyone who knows cats know that occasionally they really do what looks like a beckoning gesture. In the Japan of old, shopkeepers often kept cats who earned their keep by catching rats. Perhaps one particular shopkeeper's cat sat in front of the store doing that cute beckoning gesture, attracting people to the shop and thereby filling up the shopkeeper's till. And the rest, as they say, is history. Perhaps. "I swear, ma'am, 'twas not me what gone an' ate that katsuoboshi." Talking in one's sleep is considered medically harmless, but that depends on what you say while asleep. Here's a video of a creepily realistic robot speaking to a throng of reporters. The dialog is in Japanese, without subtitles, but what "she" is essentially saying is that she's a super-realistic "actroid," how difficult she was to develop, that her realism is thanks to something called air-servo system technology, and that she's here to serve humankind. Hey, doesn't that last line sound like something out of a "Twilight Zone" episode? What with all the stress and distractions that today's couples face, many are opting for procreation vacations. The concept has long existed in Japan, where it's called kozukuri ryoko (literally "baby-making trip"), and where the practice no doubt got started because of the small size and thin walls of the traditional Japanese home—and the tradition of eldest sons living with mom and dad after marriage. At AnOunceOfPrevention.org, Dr. Tony Vendryes states that green tea is the best source of caffeine. I found a well-written review of the 1964 Japanese film classic, Woman in the Dunes. I've re-watched it recently and can attest that it's a unique and engaging film that still holds up today. ... inside the Buddhist Komyoji temple, one of many across Japan offering new services -- concerts, discos, yoga classes -- in a struggle to stay relevant despite an increasingly secular society. By the way, although the name "Mellow Monk" is a reference to one of the first monks to bring the practice of growing and brewing green tea to Japan from China, Mellow Monk is not affiliated with any religious organization. A study finds that tea really is soothing: Subjects given real tea instead of a "fake tea" placebo had lower levels of the stress hormone cortisol. Japan's Hinode spacecraft ("Hinode" means "sunrise"), currently in Earth's orbit, has started taking ultrahigh-resolution pictures of the Sun. 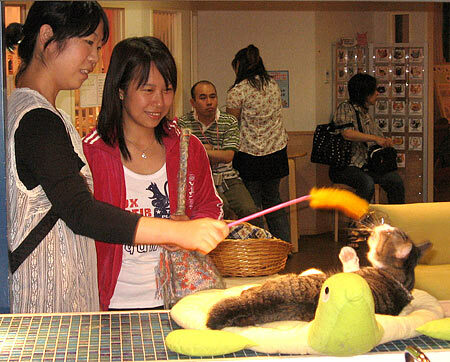 Life in Tokyo is fast-paced, so stress-busting services there are many and varied, including oxygen bars and cat therapy. I was so busy being mellow that I didn't realize that November 1st was Sushi Day in America. But at SushiDay.com, every day is Sushi Day. 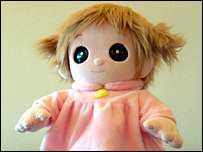 In 1978, Hitomi Soga (then 19 years old) and her mother mysteriously disappeared. A few years ago, Japan was stunned when longstanding rumors that the pair had been kidnapped by North Korean agents proved true. Now, the Japanese police have obtained an arrest warrant for one of the kidnappers. A flavonoid called epigallocatechin gallate (EGCG), which is found naturally in green tea, has been shown to block the ability of the AIDS virus to hijack and destroy immune-system cells. A writer reflects on the source of all the stress that once plagued her: herself. Japanese pitching sensation Daisuke Matsuzaka was officially put up for auction Thursday by the Seibu Lions, and American Major League teams have until next Wednesday to submit their bids. A study shows that vegetables are not only good for you in the generic sense but also can help keep your mind young as your body ages. For some of us, that's highly relevant news. Modern living has killed off napping, but modern science is showing that naps can be incredibly rejuvenative and healthy. In this video clip, narrator David Attenborough explains how some clever crows in Japan have figured out how to crack particularly hard nuts. The growing numbers of Japanese who celebrate Halloween don't know much about the holiday's origins or significance other than it's from the United States ... and is a fine excuse to dress up and have a lot of fun. If you ever wanted to know how to throw a bo shuriken (Japanese throwing spike), then this site is for you.